Rome, Wisconsin, that is. Say hello to your next must-play golf destination. Yes, it’s off the beaten path in Central Wisconsin. Rome has a population of fewer than 2,700 and if you look at Wisconsin’s outline as a mitten, Rome is smack dab in the middle of the state. Rome, an already popular lake and summer home destination is remote but accessible, only 90 minutes north of Madison, the state capital, 45 minutes north of Wisconsin Dells and 20 minutes south of Wisconsin Rapids, neatly snuggled between Lakes: Arrowhead, Sherwood, horseshoe-shaped Camelot and Petenwell, Wisconsin’s second-largest lake. You haven’t heard about Rome? You hadn’t heard about Bandon, Oregon, either, until Chicago business magnate, Mike Keiser, found it and turned it into America’s most exciting new golf resort, Bandon Dunes, with four spectacular 18-hole courses overlooking a wild coastline and the Pacific Ocean. Keiser is doing the same thing in Rome, minus the ocean, with two spectacular courses. Sand Valley is the first and it’s a game-changer. The discovery of a gigantic inland sand dune made Keiser overlook one of his primary requirements for golf—an ocean view. Ben Crenshaw and Bill Coore, who designed Bandon Trails, an inland course at Bandon Dunes, also did Sand Valley. It doesn’t look like any other course in America. It’s a heathland track with dunes, sand barrens, native plants such as—believe it or not!—prickly pear cactus and miles of trees. The greens are big and while the course is rife with yawning sand pits, most of the trouble is on the side and avoidable for even average-skilled golfers. Parts of Sand Valley look scary, but the course is playable and user-friendly. The view from The Volcano, the large mound overlooking the first and tenth tees where Craig’s Porch (snack shack) and the starter are located, are breathtaking. You see nothing but sand dunes and ridges and trees—future potential golf holes in every direction. Mammoth Dunes is the second course. David McLay Kidd, who designed Bandon Dunes, laid out this track. It won’t officially open until 2018, but nine holes are expected to open for play later this summer. It looks every bit as stunning as Sand Valley. Also, Coore and Crenshaw will be finishing up a Par 3 course that may be ready for limited preview play in the fall, but open early spring. Number of holes and name to be determined. 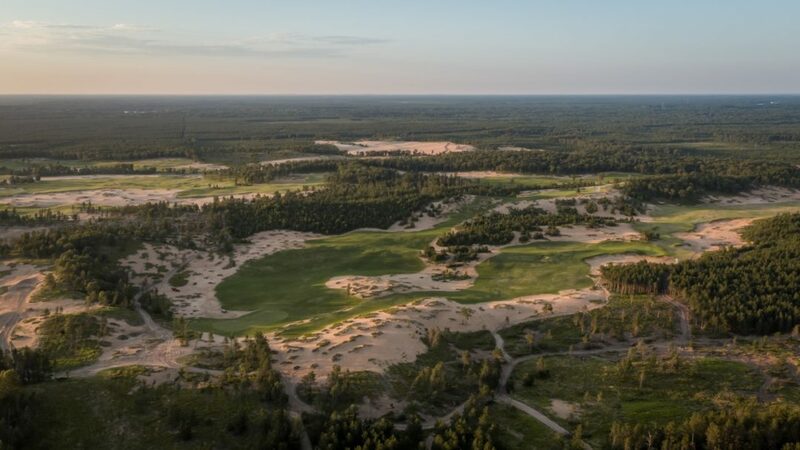 In fact, golfers can get a preview of Mammoth Dunes by entering The Heathland Cup, a three-day 54-hole golf event for two-man teams scheduled for September 2-4. Golfers will have an optional 18-hole practice round on September 2nd, followed by a welcome reception. Day two will start with 18 holes on Sand Valley and Mammoth Dunes. The final day, the participants will play another 18 holes on Sand Valley with lunch and awards to follow. Entry fees start at $1000 with double occupancy lodging. 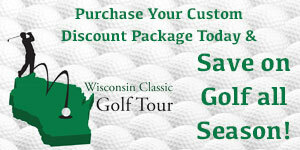 More information available from Sand Valley Golf Resort, sandvalleygolfresort.com or 715-325-9500. Nearby, Lake Arrowhead has 36 parkland style holes that are open to the public, and offer an amenity that you cannot find next door…golf carts. For more information call 715-325-2929. Sand Valley and Mammoth Dunes are also available for public play and while they’re heavily booked in the fall, limited tee times and rooms are still available. Lodging on site is available—53 rooms—and the 30,000-square-foot clubhouse is open and operational. Dinner entrees vary from traditional Up-North fare such as Lake Erie Walleye and Northwoods Chicken to 14 oz Veal Chop and Pappardelle Alla Bolognese with meatballs, and are backed up by a five-star wine list. The popular on-course dessert from the halfway house—Nye’s Ice Cream Sandwich—is also available in the dining room. Nye’s come in assorted gourmet flavors and are THE talked-about item at the shack. If you want to start a heated debate, ask two Sand Valley golfers their favorite Nye’s flavor, and then stand back. Key Lime? Vanilla Coconut? Cookies ‘N Crème? Yes, yes and yes. If you want to start another heated debate, head into town and mingle with the locals at Pritzl’s Trading Post. You can find conversation on any topic, since it’s pretty much the official heart and soul of Rome. It’s the all-purpose modern general store. Pritzl’s has groceries, deli meats, fishing and hunting licenses, ATV’s (all-terrain vehicles), burning permits, jelly donuts, maps, bait—well, just about everything. Additional lodging options in the town of Rome include the 19 unit Lodges of the Lakes along the Lake Arrowhead Pines course, and the 23 unit Shermalot Motel overlooking Lake Sherwood. For more information, www.lodgesofthelakes.com or www.shermalot.com. With the many area lakes, Rome has long been a popular recreation destination for boating, water sports, hunting and fishing, biking, hiking and birding. Now, a first-class golf resort with two courses adds to the area’s many options. There have been rumors that two more golf courses will be built, too. There is no official word on that but ask yourself this—did Keiser stop after two courses at Bandon Dunes? Definitely not. Do all roads lead to Rome? Not yet. But it wouldn’t be a bad idea to get started on that.